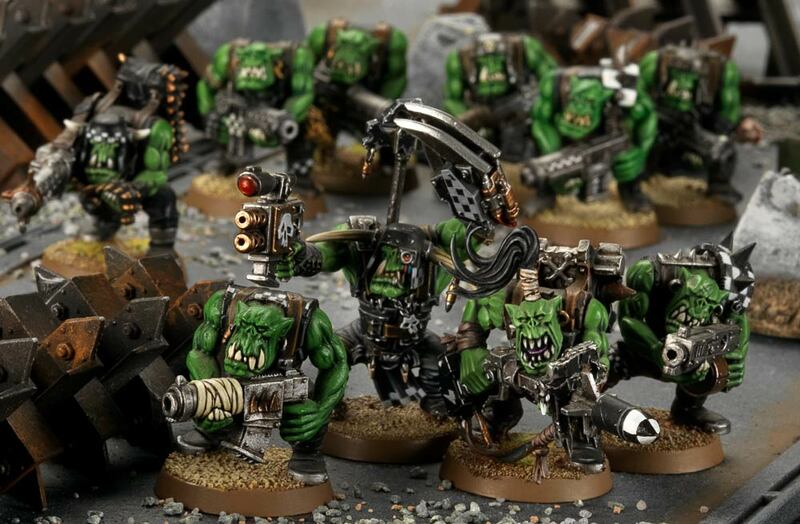 Die Orks in Warhammer 40.000 bestehen aus unterschiedlichen Clans und Games Workshop geben einen Ausblick auf ihre Besonderheiten im kommenden Codex: Orks. Bigger, meaner and ’arder than any other Orks in the galaxy, the Goffs are violent, direct and constantly spoiling for a fight. Battling anything and everyone they encounter (including each other in the absence of suitably fighty opponents) the Goff’s are the Orkiest Orks that ever Orked. Though they are happy to pursue any means to victory – be it kunnin’, speedin’ or shootin’ – they love nothing more than krumpin’ the enemy “up-close an’ personal”. Being the most warlike of a warlike race, it is no surprise that the deadliest Ork of them all, Ghazghkull Thraka, is a Goff. 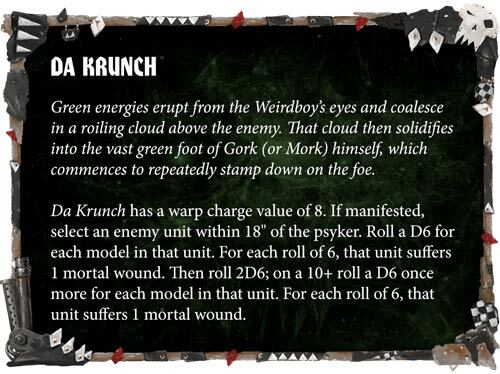 This simple but effective Clan Kultur makes your army that little bit better when it’s getting stuck in with brutal melee combat, and complements Dakka! Dakka! Dakka! superbly – whether you’re shootin’ or choppin’ up your enemies, you’ll be generating free attacks on hit rolls of 6. 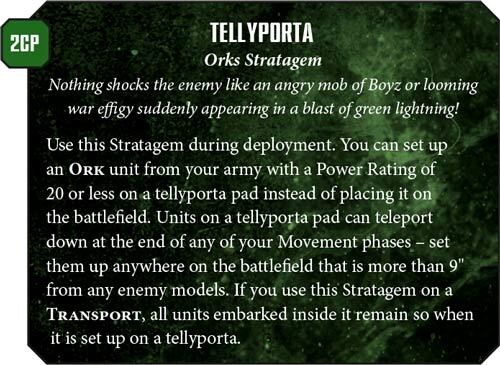 You can combine this Stratagem with any Orks unit you wish, as long it has a Power Rating of 20 or under, but that’s potentially a full unit of 10 Meganobz! With their ’Ere We Go ability enabling you to re-roll either one or both of the dice when making your charge roll, you stand a great chance of getting this deadly unit stuck in as soon as they arrive. In game terms, the difference between Strength 4 and 5 is a huge. 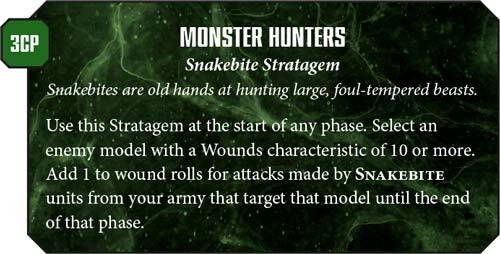 It will enable you mince Toughness 4 units and threaten tanks (even Imperial Knights!) with your sheer volume of attacks. 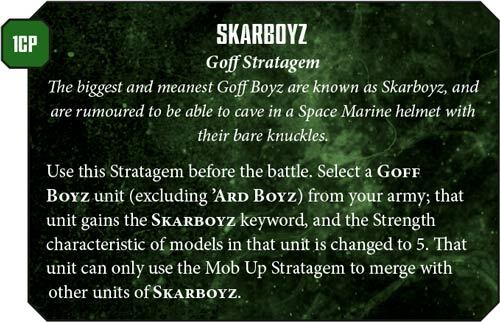 To make the most of the Stratagem, be sure to take a full unit of 30 Boyz to upgrade in this manner. That way, Skarboyz you’ll be dishing out the better part of 100 Strength 5 attacks! 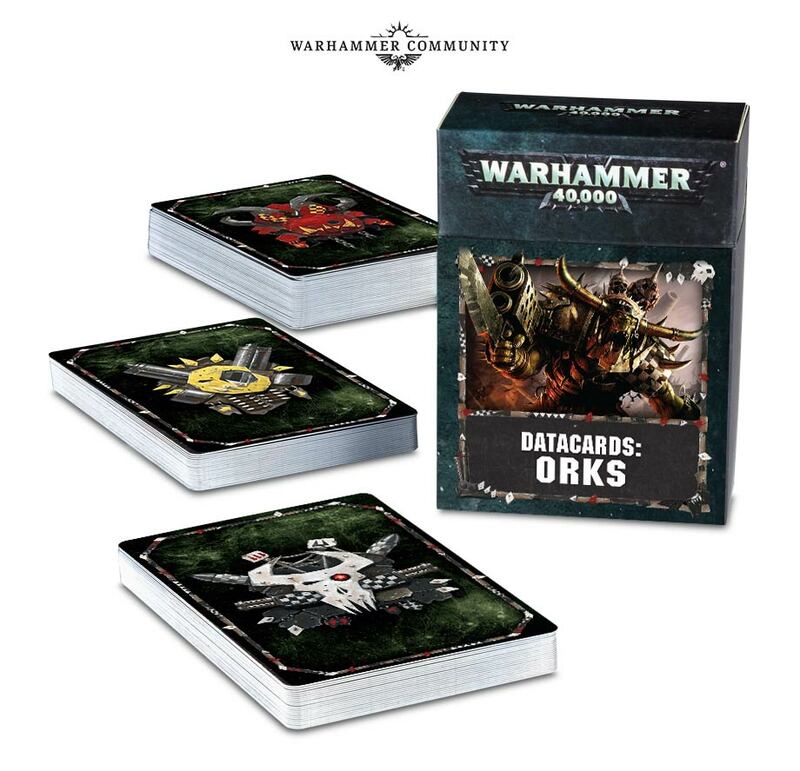 On a separate note, a number of you have been asking if there will be a set of Ork datacards available with the codex. We can happily confirm that there is indeed. We have proof and everything! 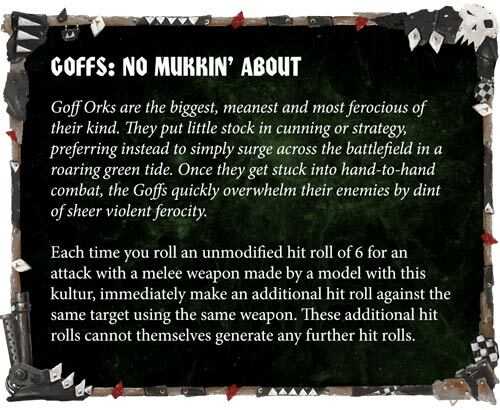 If you want to smash your enemies up in close combat, you really can’t go wrong with the Goffs. 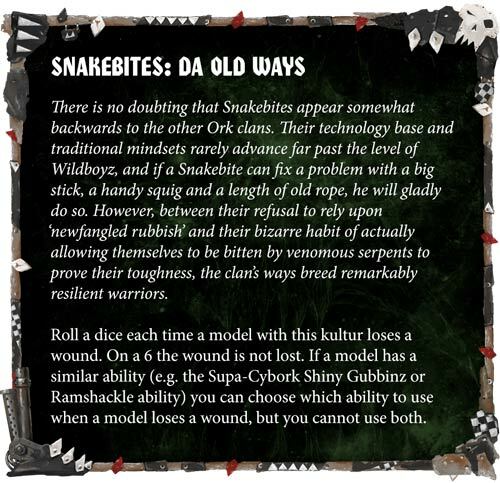 If you’re after something a bit more subtle (well, by Ork standards), stay tuned – we’ll be previewing the Snakebites and their mastery of “da old ways” tomorrow. If you’re looking to kickstart your Goff horde, the Start Collecting! Orks set will see you right. 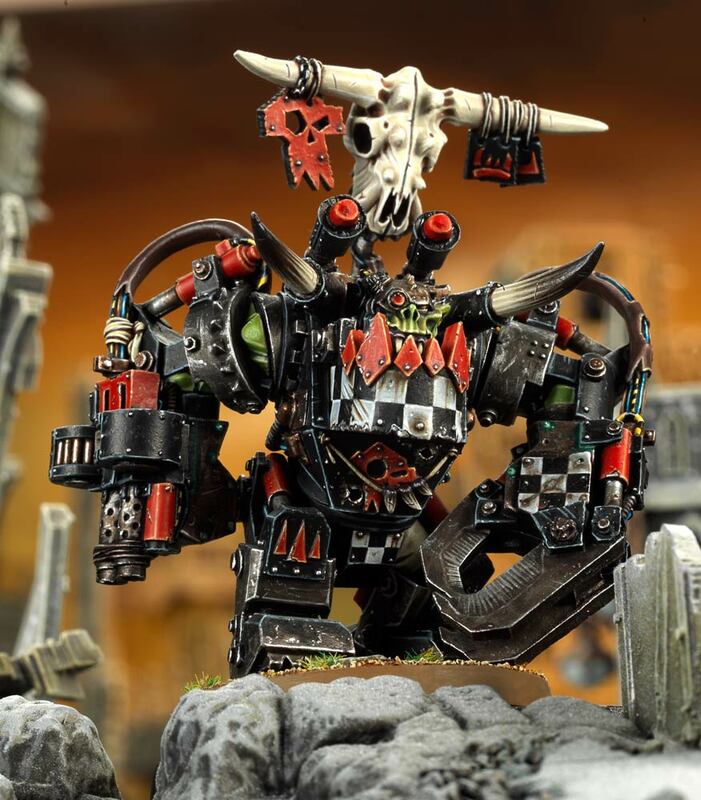 It’s got Boyz, Nobz and a Deff Dread – it couldn’t be any more suited to Goffs! 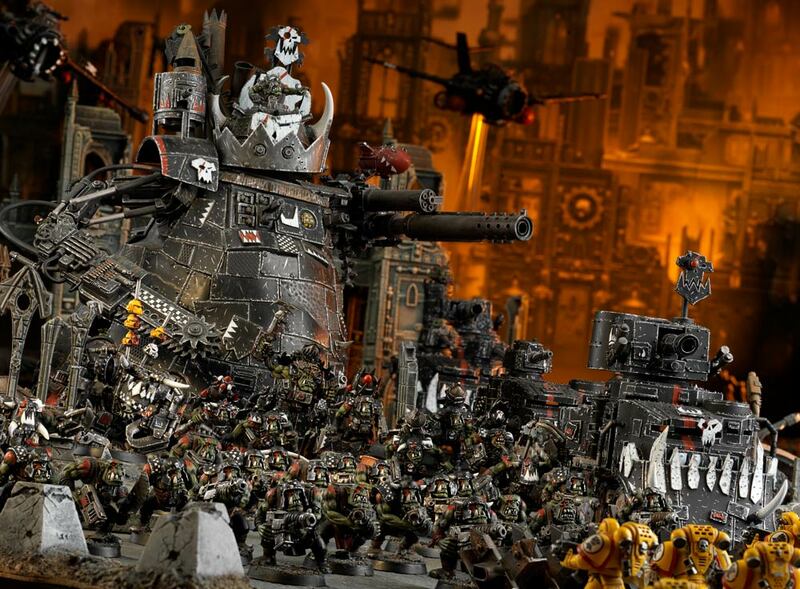 Orks these days, eh? Runnin’ around, blasting each other with dakka, too fancy and high-falutin’ to use exploding squigs. “Da old ways” favoured by the Snakebite Clans date back to a simpler time, when an enterprising Ork only needed his wits, a choppa and an unbridled will to do violence unto other living creatures. 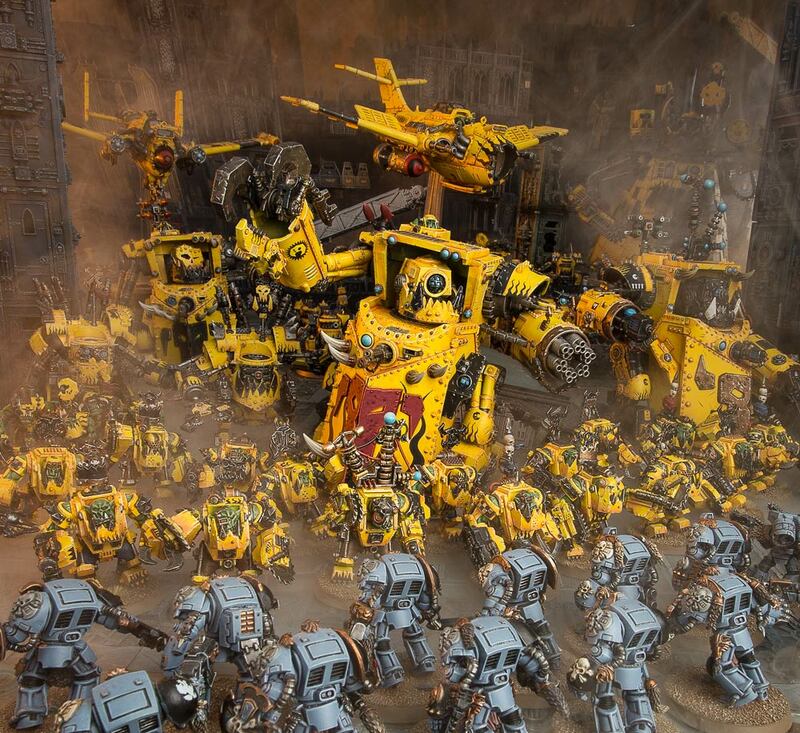 In those days, the Ork race had yet to encounter (and subsequently be inspired by) the ‘beaky’ Space Marines and the mighty Imperial Knightsand Battle Titans of the Adeptus Mechanicus. 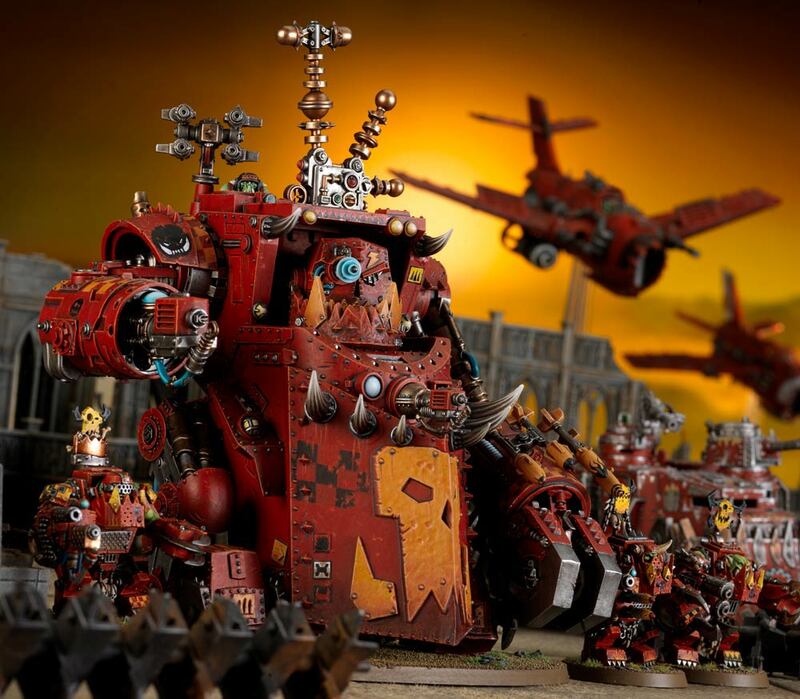 Though many of the other clans embraced the towering war engines and wazzy new technology the Meks created in answer to the Imperium’s fightiest machines, the Snakebites preferred to keep things simple as much as possible – after all, why build a Stompa when you’ve got a perfectly good Squiggoth to stomp the enemy flat? 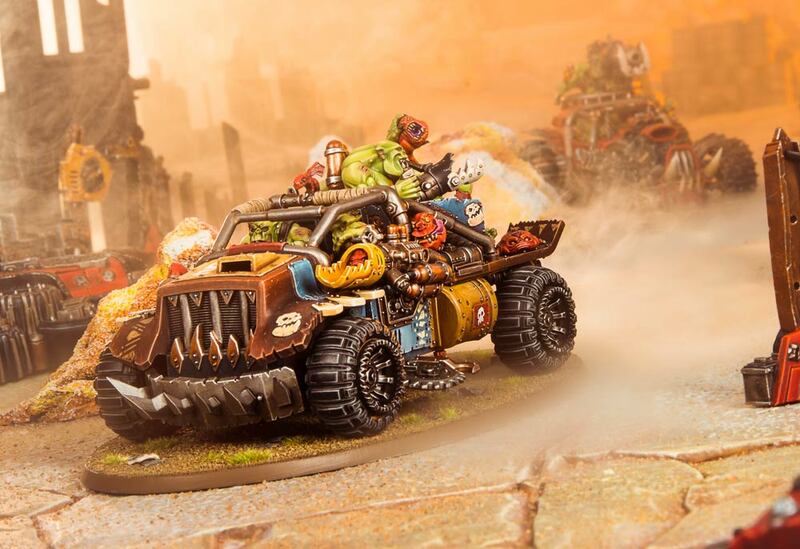 With their squig launchas and sturdy construction, Rukkatrukk Squigbuggies are every bit the iconic Snakebite vehicles. 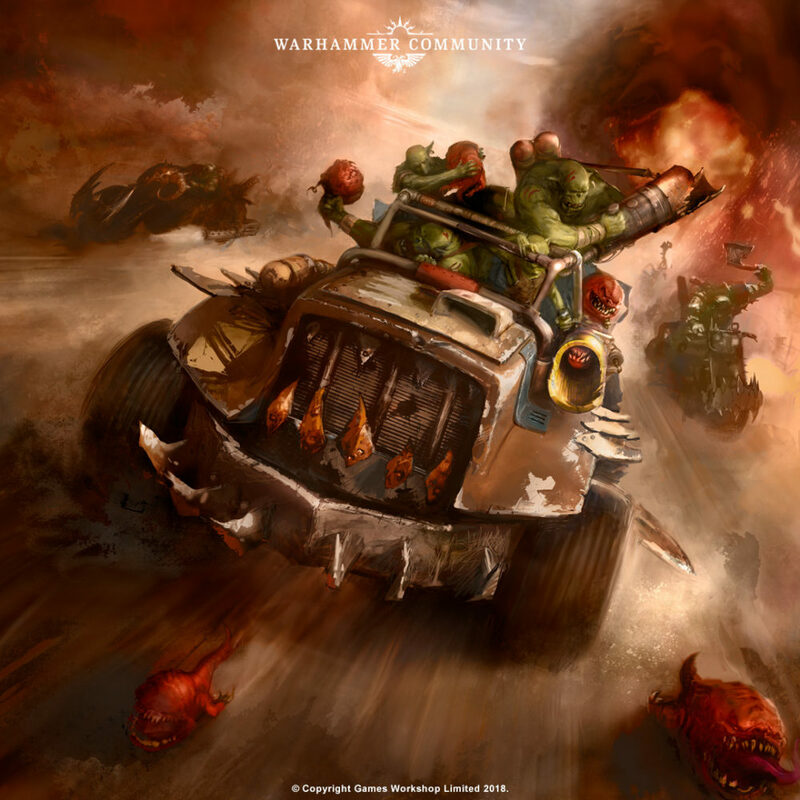 The Rukkatrukk’s speed, combined with the long range of its squig-launching weaponry, means that it can threaten almost anywhere on the battlefield with a salvo of bile, bitey or boom squigs. 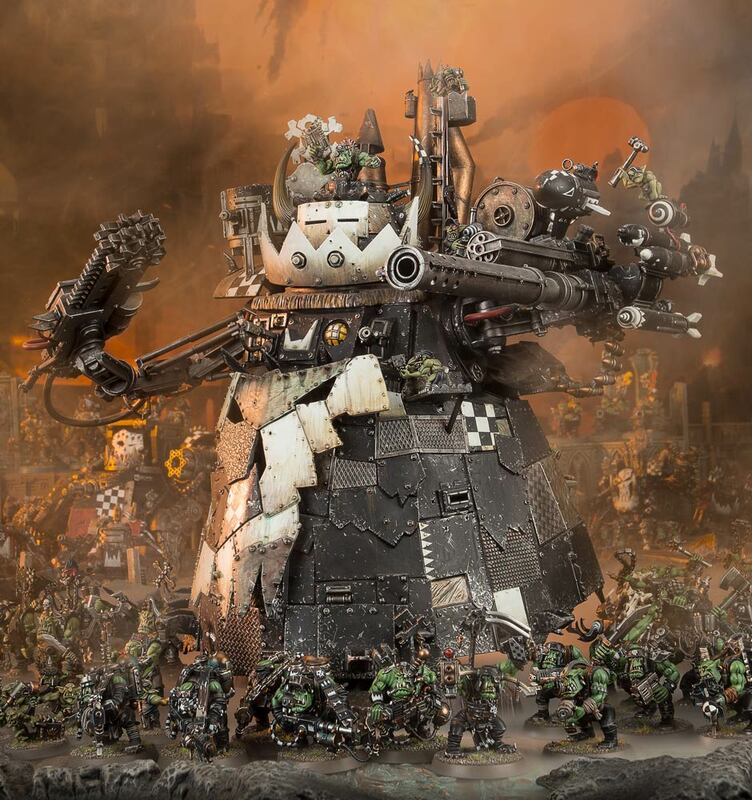 And in the case of its nasty heavy squig launcha, the Grot Gunner ensures it hits on a 4+ – deadly accuracy for an Ork weapon! 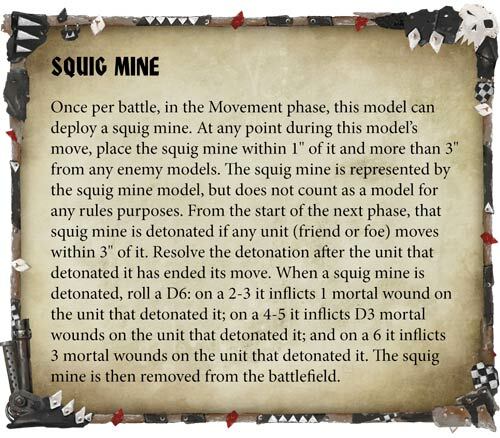 Another trick up the Rukkatrukk’s sleeve (or crammed in its squig cargo bay, to be precise) is its squig mine. By fielding two or even three of these vehicles, you’ll be able to effectively block off an area of the battlefield by laying a bunch of squig mines. Even an Imperial Knight will have to think twice about moving through an area if it has the potential to suffer 9 mortal wounds by doing so! No Ork clan is richer than the Bad Moons – and the Bad Moons never tire of reminding everyone else of that fact. This is due to the simple fact that Bad Moons grow teef (which is what passes for Ork currency) much faster than the Orks of other clans. 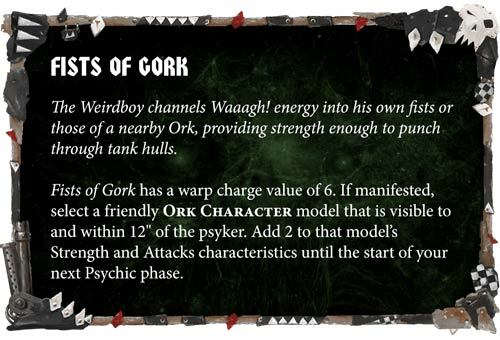 Of course, what this means is that every other Ork knows that if you’re short of a few teef, you just need to smash a Bad Moon in his gob to be rewarded with a shower of currency! This leads every sensible Bad Moon to spend their teef on the biggest, shootiest gunzto deter any would-be attackers. 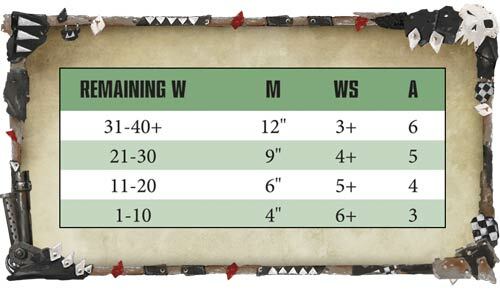 The Bad Moons are the shootiest Ork clans you can choose, giving you a welcome re-roll of 1s to hit in the Shooting phase. Combined with Dakka! Dakka! Dakka!, you’ll be able to make the most of your shootin’ and blow the enemy away in murderous salvoes of bullitz, wazzy lazerz and bomms. It would almost be rude to talk about Bad Moons and not give this awesome vehicle a quick look at. 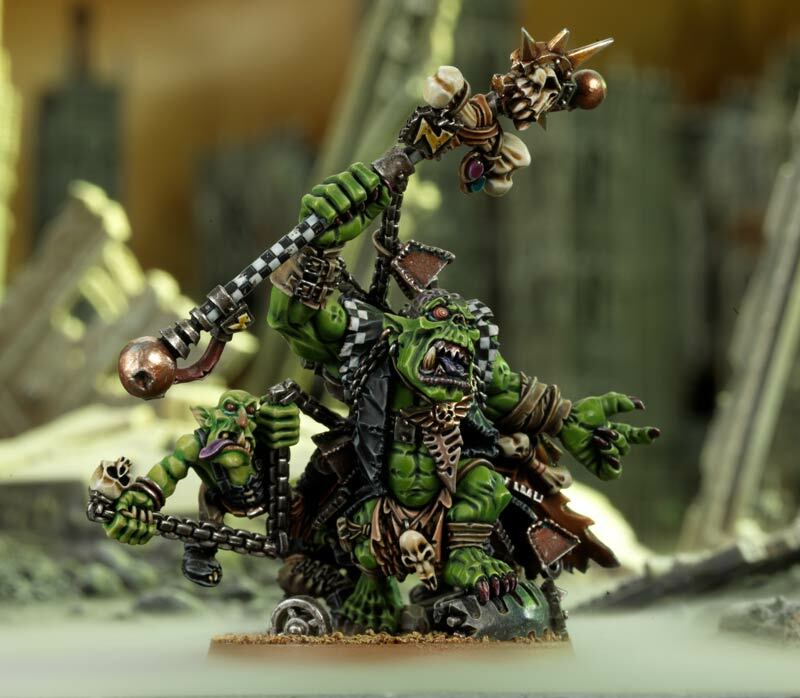 It’s not only ridiculously shooty, but is also one of the most accurate units in the army thanks to its Grot Gunner and Targetin’ Squig ability, which add 2 to your hit rolls when firing its deadly kustom shokk rifle. Rolled a 1 to hit? Don’t worry, you can re-roll that – you’re a Bad Moon, remember? 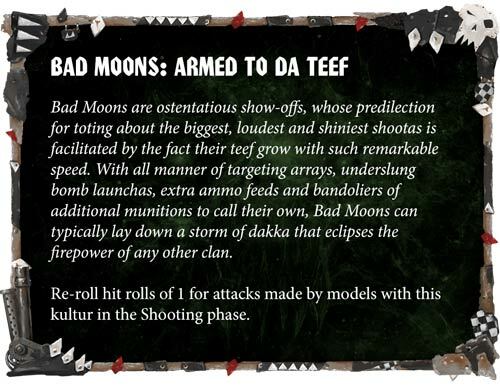 If you want nothing more than to annihilate your foes with epic levels of dakka, you’ll want to choose the Bad Moons for your Clan Kultur. 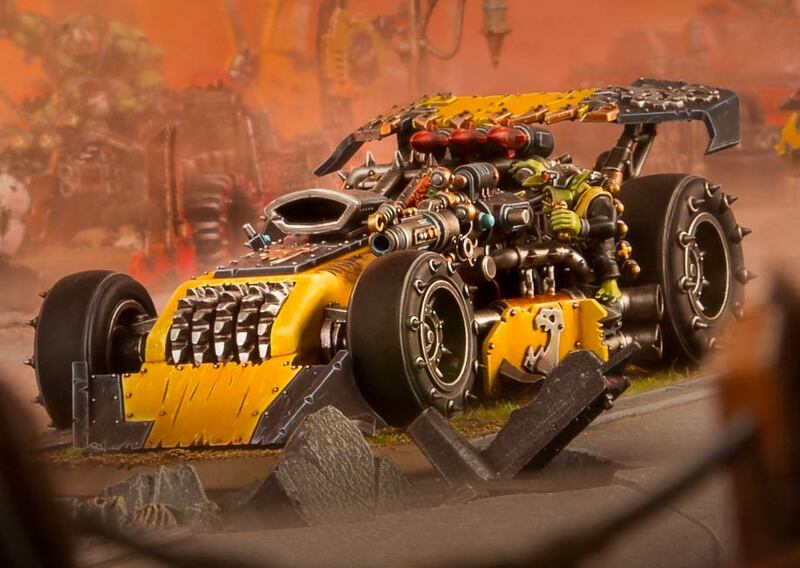 If you haven’t already picked up a copy of Speed Freeks and got your hands on a Shokkjump Dragsta, you can pre-order yours now. Ich denke nicht dass GW dabei ein komisches Gefühl hatte, wenn ich bedenke wie alt die Orkboys sind. Das sind die Plastik-Megabosse, also kein Grund zum schämen. Würde mich aber auch über neue Boyz freuen, auch wenn ich den 40k-Zug komplett verpasst habe. Ich mag die Orks einfach. Merkwürdig, auf der US Seite sind sie noch verfügbar. Aber vielleicht wird das in ein paar Stunden dort nachgezogen. Bei Bikes würde mich das wundern, da die in der Speedfreaks Box enthalten sind. Beim Rest könnte man hoffen, dass es mehr als ein Umpacken ist. Das dürfte nur das Reboxing für die größeren Bases sein. Auf den Bildern sieht man die Orkmodelle in der Regel auf 32mm Bases. Diverse Gerüchteseiten und youtube Kanäle haben auch über die größeren Bases berichtet. Wobei das schon von Kill Team ab zu sehen war. Boys und Grotz sind bei mir verfügbar, dafür die SC Box nicht mehr. GW-Laden um die Ecke, gab es die Posaz meine auch als last chance. Ganz verstanden habe ich es auch nicht mit Release um die Ecke. Da muss Neues kommen. Bei allen haben sie die Selbstverletztungsregel rausgekommen (wenn man nicht überlädt) nur die Orks mit ihrem BF1+ , ach ne warte es sind ja 5+, behalten diese Regel. Warum hat man nicht was spaßiges eingeführt wie, die Waffe hat dann 2 W6 Treffer und der Schütze bekommt eine tötliche. 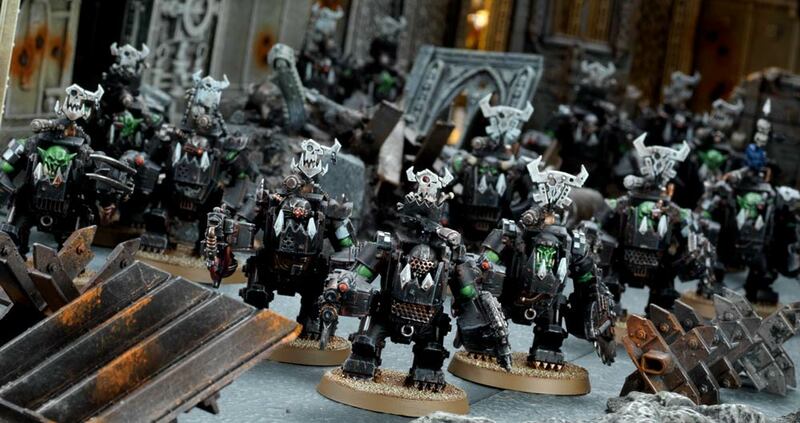 Ich hoffe, hoffe, hoffe das sind ein paar Änderungen im Codex, damit ich meine Orks nach ca. 3 Jahren wieder spielen mag, ohne jetzt unpassende Autos für meine Blood Axes anschaffen zu müssen.